Jodie Evans and her fellow CODEPINK protesters saw a lot of action last week, making headlines with an in-your-face Women's Day campaign against U.S. financial giant Bank of America. The coordinated demonstrations happened in multiple cities across the States, organized by activist group CODEPINK and Occupy Wall Street offshoot, "WomenOccupy". Dressed in a hot pink Wonder Woman costume, Evans joined colleagues and disrupted a room full of banking executives in the Waldorf Astoria ballroom with an outburst targeted at Bank of America CEO Brian Moynihan. After approaching the stage to remove her shirt, Evans was escorted out by security. 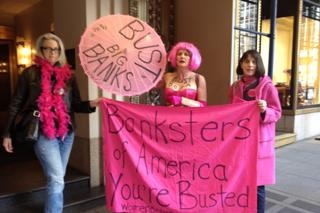 Then, CODEPINK co-director Rae Abileah and co-founder Medea Benjamin managed to strip down to their bras and launch into a critical speech about Bank of America. Moynihan's response was simply a pause and a stone-faced, "As I said..."
"I am shocked at the violence we experienced today, women who work for peace and economic justice are behind bars while B of A gets away with destroying the lives of hard working citizens. We need to reclaim Justice on International Women's Day," said Evans.